This project has several components: A 6 x 9 pocket folder with a 12-page stitched insert, financial/donor listing that folds out to a 22 x 17 poster, response envelope and mailing envelope. I developed this format for the 2009 annual report and due to the positive response it has received, the piece has been formatted the same for the past 3 years. Only the general design and look of the piece has changed. Click here to see a PDF of the 2009, 2010 or 2011 Annual Report. The format of the Annual Reports changed in 2013 to a booklet. There was no Annual Report produced for 2012. 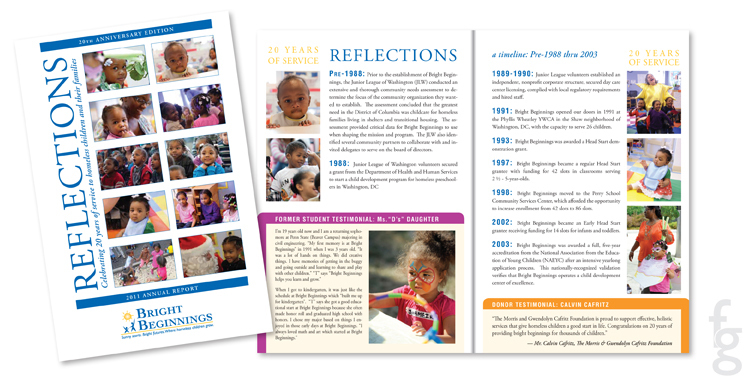 Click on the year to view a flipbook version of the 2013 or 2014 Annual Report.